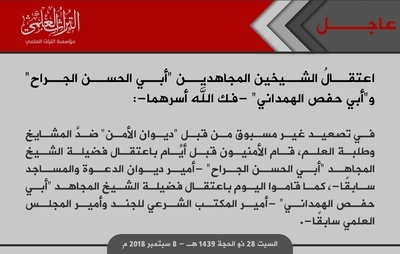 As mentioned in my previous post, Mu'assasat al-Turath al-'Ilmi ('Ilm Heritage Foundation) is widely disliked among supporters of official Islamic State media for its dissemination of books and studies without authorization from the Islamic State's media department and its broadcasting of claims of internal troubles in the Islamic State. It is the latter aspect of Mu'assasat al-Turath al-'Ilmi's output that I will focus on in this post. 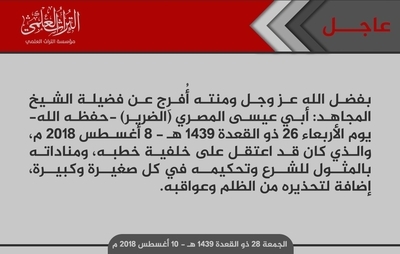 Mu'assasat al-Turath al-'Ilmi has posted some 23 news items in addition to the vast collection of texts and audio messages by Islamic State scholars. The majority of these news items concern the arrests of sheikhs and students of 'Ilm (Islamic knowledge), who, in the foundation's view, are ashab al-manhaj al-salim ("having the sound manhaj"). In the foundation's narrative, the people of sound manhaj contrast with 'extremists'/'innovators', 'ignorant', 'unqualified' and otherwise unjust individuals who are portrayed as playing a disproportionate role in the Islamic State today. Though Mu'assasat al-Turath al-'Ilmi might be seen as representing a more 'moderate' face of the Islamic State, it should be noted that the foundation does not question the position of Islamic State leader Abu Bakr al-Baghdadi as caliph, addressing him as the Amir al-Mu'mineen ('Commander of the Believers') in one of its news items. 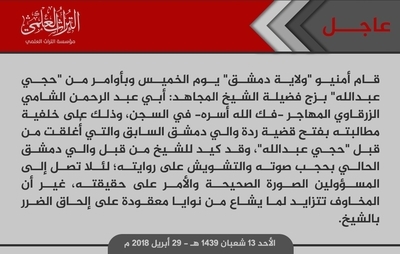 Further, while some al-Qa'ida (AQ) supporters might be hopeful that common ground could be struck with the more 'moderate' trend of the Islamic State, the case of Mu'assasat al-Turath al-'Ilmi shows that such hopes are probably ill-conceived. Note the disparaging reference in one post to Abu Muhammad al-Maqdisi (a leading pro-AQ ideologue): "May God bring him to ruin." In addition, among the sheikhs in the Islamic State whom the foundation reveres is one Abu Ya'qub al-Maqdisi, who is mentioned as having declared takfir against Abu Muhammad al-Maqdisi. A fair question that the reader might ask is how reliable the foundation's information is. One could after all portray the entire enterprise of Mu'assasat al-Turath al-'Ilmi as a foreign intel operation. In my view though, some points speak in favour of the reliability of the facts of the news items that the foundation conveys, even if its interpretation of the facts is wrong. 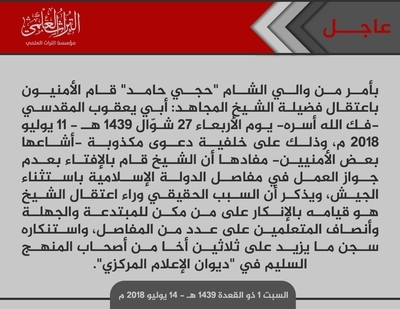 First, as I noted in the foundation's publishing of Abu Malek al-Tamimi's "Nigerian Questions," the text published by Mu'assasat al-Turath al-'Ilmi can be corroborated as genuine by comparison with the Islamic State West Africa Province's self-history where Tamimi's work is cited. Second, that there might be internal disputes, arrests and purges in the Islamic State despite its extremely precarious position as an entity controlling territory should not necessarily come as a surprise. One can make a historical comparison, for example, with internal arrests, accusations of betrayal and executions that took place in the last days of Nazi Germany's existence. 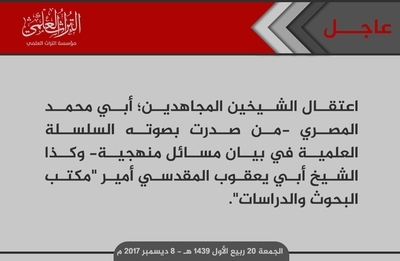 Or perhaps more appropriate for comparison are the internal arrests and executions that took place inside the small Islamic State affiliate Jaysh Khalid bin al-Waleed (JKBW) in southern Syria, including the case of the former head of the group's Islamic court (Abu Ali Saraya). Third, it is notable that one of the Mu'assasat al-Turath al-'Ilmi news posts mentions a certain 'Hajji Hamid' as a "wali of al-Sham" (i.e. a governor of a Wilayat al-Sham, encompassing all the Syrian regions). 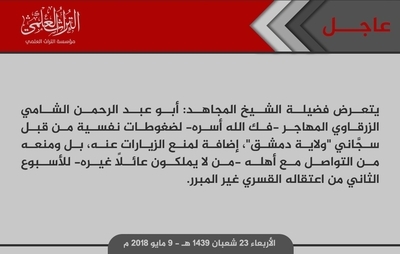 This news post came days before the Islamic State announced the concept of a Wilayat al-Sham to the outside world in its propaganda, indicating that the foundation has genuine inside knowledge on administrative workings in the Islamic State. 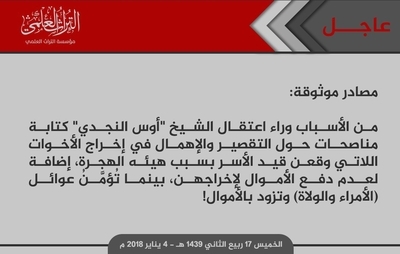 In a similar vein, one should note that there was a wali of Wilayat Hawran in the JKBW area some time before the Wilayat Hawran was announced in Islamic State propaganda to the outside world. As a side note: it can be seen that the greater Wilayat al-Sham existed at least for some time alongside the smaller Wilaya designations in Syria. 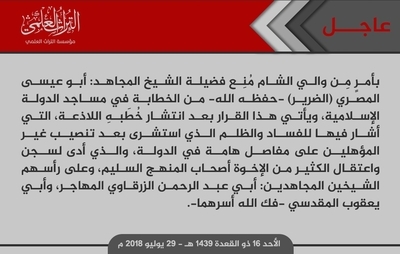 Whether that is still the case is unclear: the propaganda designations currently give the impression of a cancellation of all the smaller Wilaya designations, with a new framework of regions of a single Wilayat al-Sham only. Finally, I have managed to find an apparent internal document that shows that some of the individuals named by Mu'assasat al-Turath al-'Ilmi have indeed come under the suspicion of the Islamic State's security apparatus: most notably Abu Ya'qub al-Maqdisi and Abu Muhammad al-Masri. 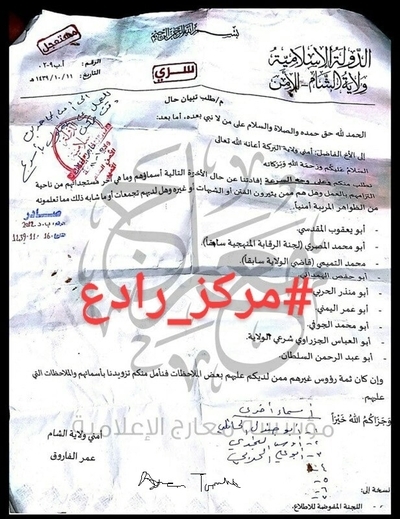 The document, dated to 11 Shawwal 1439 AH (c. 25 June 2018 CE), is addressed from the security head of Wilayat al-Sham to the security head in the Wilayat al-Baraka area (located in eastern Syria), giving a list of individuals and asking about their status, the latest developments in terms of their compliance with work, whether they are stirring up doubts, whether they have gatherings, and whether there any suspicious signs in terms of security. - Muhammad al-Tamimi (previously the qadi/judge of the wilaya). Presumably the references to 'wilaya' in the list are Wilayat al-Baraka. In additional handwriting on the bottom of the document, another name mentioned in the Mu'assasat al-Turath al-'Ilmi posts turns up: Aws al-Najdi. It is not clear how far these internal disputes impact the Islamic State's ability to function on the ground, but they are divisions worth noting. Any new updates Mu'assasat al-Turath al-'Ilmi provies will be added. 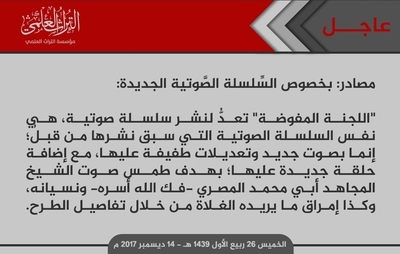 Further, the foundation released a longer statement in defense of Abu Ya'qub al-Maqdisi that will be analyzed in a subsequent post. Below are Mu'assasat al-Turath al-'Ilmi's news postings translated. Arrest of the two mujahid sheikhs: Abu Muhammad al-Masri (by whose voice was issued the 'Ilm series on clarifying issues of manhaj) and Sheikh Abu Ya'qub al-Maqdisi, amir of the Maktab al-Buhuth wa al-Dirasat. Friday, 20 Rabi' al-Awal 1439 AH/8 December 2017 CE. Sources: leaders in the previous 'Delegated Committee', which issued the cancelled statement of innovation, were behind the arrest of the two sheikhs. Those who were responsible for the previous statement of innovation got out some time before the arrest of the two sheikhs (may God free them). 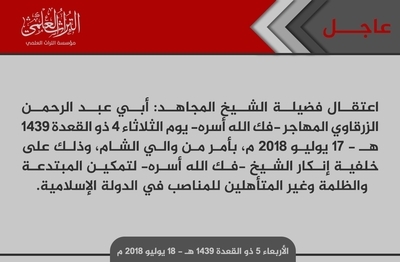 The Delegated Committee is preparing to publish an audio series: the same audio series that was previously published, but in a new voice and with minor modifications to it, while adding a new section to it, with the aim of obliterating the voice of the mujahid Sheikh Abu Muhammad al-Masri- may God free him- and forgetting him, and likewise allowing the pass through what the extremists want through the details of the suggestion. Thursday, 26 Rabi' al-Awal 1439 AH/14 December 2017 CE. By the grace of God alone, the two sheikhs Abu Muhammad al-Masri and Abu Ya'qub al-Maqdisi (may God protect them) have been freed. Friday, 27 Rabi' al-Awal 1439 AH/15 December 2017 CE. Reliable sources affirm that the Diwan al-Amn has arrested 'Aws al-Najdi', who was the deputy amir of the Diwan al-Qada previously and recently assumed the position of amir of the Shari'i office for the Diwan al-Jund. Thursday, 17 Rabi' al-Thani 1439 AH/4 January 2018 CE. Among the reasons behind the arrest of Sheikh Aws al-Najdi: writing advisory opinions on the shortcoming and neglect in getting out the sisters who had been taken prisoner because of the Hijra Committee, in addition to lack of payment of money to get them out, while the families of the amirs and walis are secured and provided with wealth. Arrest of Sheikh Abu Muhammad al-Masri- may God deliver him- for the second time in a row since around a week and a half ago, for reasons unknown until now. Note that the sheikh- may God free him- is ill and elderly. Tuesday, 27 Jumada al-Awal 1439 AH/13 February 2018 CE. After the spreading of the news of the arrest of Sheikh Abu Muhammad al-Masri- may God protect him- he has been released following a period of detention that lasted for two consecutive weeks for unknown reasons. Friday, 30 Jumada al-Awal 1439 AH/16 February 2018 CE. The security personnel of Wilayat Dimashq on Thursday and by orders from Hajji Abdullah have imprisoned his eminence the mujahid Sheikh Abu Abd al-Rahman al-Shami al-Zarqawi al-Muhajir (may God free him). This follows his request to open the case of the apostasy of the previous wali of Damascus that was closed by Hajji Abdullah. The current wali of Damascus conspired against the sheikh through concealing his voice and distorting his narration, lest the true picture and matter in its true form should reach the officials. But the fears are growing for what is spread from the signaled intentions to do harm to the sheikh. Sunday, 13 Sha'aban 1439 AH/29 April 2018 CE. His eminence the mujahid Sheikh Abu Abd al-Rahman al-Shami al-Zarqawi al-Muhajir (may God free him) is being subject to psychological pressures by the jailers of Wilayat Dimashq in addition to prevention of visits for him, and also preventing him from contacting his family, who have no other support besides him, for the second week since his coercive, unjustified arrest. Wednesday, 23 Sha'aban 1439 AH/9 May 2018 CE. By the grace of God (Almighty and Exalted is He) and His blessing, generosity and nobility, his eminence the mujahid Sheikh Abu Abd al-Rahman al-Shami al-Zarqawi al-Muhajir (may God protect him) has been freed. Thursday, 1 Ramadan 1439 AH/17 May 2018 CE. By order of the wali of al-Sham (Hajji Hamid), the security personnel arrested his eminence the mujahid Sheikh Abu Ya'qub al-Maqdisi- may God free him- on Wednesday 27 Shawwal 1439 AH (11 July 2018 CE), and that was following a false case- spread by some of the security personnel- claiming that the sheikh had issued a fatwa not permitting work in the sectors of the Islamic State except the army. And it is worth mentioning that the true reason behind the arrest of the sheikh is his condemnation of the one who put in place the innovators, ignorant and half-learned folk in a number of the sectors, as well as his condemnation of the imprisonment of more than 30 brothers from those of the sound manhaj in the Diwan al-'Ilam al-Markazi. Saturday, 1 Dhu al-Q'ida 1439 AH/14 July 2018 CE. 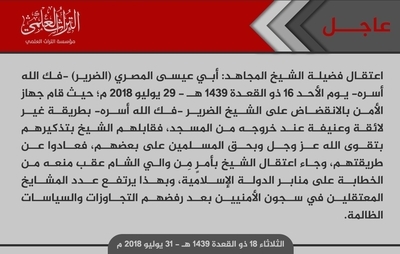 Arrest of his eminence the mujahid Sheikh Abu Abd al-Rahman al-Zarqawi al-Muhajir- may God free him- on Tuesday 4 Dhu al-Q'ida 1439 AH (17 July 2018 CE) by order of the wali of al-Sham, and that is so following the condemnation by the sheikh- may God free him- of putting in place the innovators, oppressors and unqualified in positions in the Islamic State. Wednesday, 5 Dhu al-Q'ida 1439 AH/18 July 2018 CE. Preparation is being done in Wilayat Dimashq for a deplorable crime, with the aim of liquidating his eminence the mujahid Sheikh Abu Abd a-Rahman al-Zarqawi al-Muhajir- may God free him- with a false case that has no basis in truth: and that is splitting rans and inciting revolt, and that is under the supervision of Abu Majid al-Falastini (known as Abu Aamer), one of the assistants of al-Hajji Abd al-Nasir and signatory to the statement of innovation, as well as the wali of Damascus and Abu al-Nur, the security official in the wilaya. We direct an urgent message to the Amir al-Mu'mineen Abu Bakr al-Baghdadi (may God make right his path) to intervene and follow the case, for the life of Sheikh Abu Abd al-Rahman al-Zarqawi is in danger! Wa hasbuna Allah wa na'am al-wakeel. Sunday, 9 Dhu al-Q'ida 1439 AH/22 July 2018 CE. By order of the wali of al-Sham, his eminence the mujahid Sheikh Abu Eisa al-Masri (al-Darir)- may God protect him- has been prevented from giving sermons in the mosques of the Islamic State. This decision comes after the spread of his stinging sermons in which he pointed to the corruption and oppression that have spread after the appointment of unqualified people over important sectors in the Dawla [Islamic State], leading to the imprisonment and arrest of many of the brothers of sound manhaj, at the head of whom are the two mujahid sheikhs: Abu Abd al-Rahman al-Zarqawi and Abu Ya'qub al-Maqdisi (may God free them). Sunday, 16 Dhu al-Q'ida 1439 AH/29 July 2018 CE. Arrest of his eminence the mujahid Sheikh Abu Eisa al-Masri (al-Darir)- may God free him- on Sunday 16 Dhu al-Q'ida 1439 AH (29 July 2018 CE), as the security apparatus assaulted the Sheikh al-Darir- may God free him- in an inappropriate and violent matter as he came out of the mosque, for the sheikh met them by reminding them to fear God- Almighty and Exalted is He- and reminding them of the rights of the Muslims upon each other, so they abandoned their way. And the arrest of the sheikh came by order of the wali of al-Sham following the blocking of him from giving sermons on the pulpits of the Islamic State, and thus rises the number of arrested mashayakh in the prisons of the security personnel after their rejection of the excesses and oppressive policies. Tuesday, 18 Dhu al-Q'ida 1439 AH/31 July 2018 CE. By the grace of God- Almighty and Exalted is He- and His blessing, his eminence the mujahid Sheikh Abu Eisa al-Masri (al-Darir) was released on Wednesday 26 Dhu al-Q'ida 1439 AH/8 August 2018 CE. He had been arrested following his sermons, and his calls to follow the law and implement its ruling in every small and big matter, in addition to his warning about oppression and its consequences. Friday, 28 Dhu al-Q'ida 1439 AH/10 August 2018 CE. The wali of al-Sham has issued a document that has been distributed orally to all the sectors of the Islamic State, in which he makes fraudulent accusations against his eminence the mujahid Sheikh Abu Ya'qub al-Maqdisi (may God protect him), making the way to get rid of him. Among them: collaborating with the Crusader 'RAND' institute and contacting the evil Asim al-Barqawi (Abu Muhammad al-Maqdisi)- may God bring him to ruin- despite the fact that Sheikh Abu Ya'qub al-Maqdisi explained in his private and public meetings his takfir against al-Barqawi. And the document did not mention any information about the fate of Sheikh Abu Ya'qub al-Maqdisi (may God rescue him). Wa hasbuna Allah wa na'am al-wakeel. Thursday, 19 Dhu al-Hijja 1439 AH/30 August 2018 CE. In an unprecedented escalation by the Diwan al-Amn against the mashayakh and students of 'Ilm, the security personnel days ago arrested his eminence the mujahid Sheikh Abu al-Hassan al-Jarrah (the amir of the Diwan al-Da'wa wa al-Masajid previously). They also arrested today his eminence the mujahid Sheikh Abu Hafs al-Hamdani (amir of the Shari'i office for the soldiers and amir of the 'Ilm council previously). Saturday, 28 Dhu al-Hijja 1439 AH/8 September 2018 CE. After a series of unjust arrests that have come upon a number of the mashayakh and students of 'Ilm, his eminence the mujahid Sheikh Abu Hafs al-Hamdani (may God protect him) has been released, praise be to God (Almighty and Exalted is He). This comes after his arrest for unknown reasons for around two days. Also his eminence the mujahid Shekh Abu Marwan al-Masri (may God protect him) has been released. He was the qadi of the Diwan al-Jund previously, and he spent the same period in the detention of the security personnel, while the security personnel until this moment still hold his eminence the mujahid Sheikh Abu al-Hassan al-Jarrah (may God release him). Thursday, 3 Muharram 1440 AH/13 September 2018 CE. 1. His eminence the mujahid Sheikh Abu Muhammad al-Masri (may God free him). 2. His eminence the mujahid Sheikh Abu Hafs al-Hamdani (may God free him) following his release days ago. 3. His eminence the mujahid Sheikh Abu 'Ubada al-Shami (may God free him): the family judge in Wilayat al-Baraka previously. Wa hasbuna Allah wa na'am al-wakeel. Tuesday, 8 Muharram 1440 AH/18 September 2018 CE.